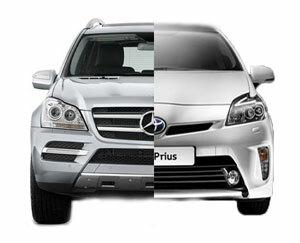 We have compared two best vehicles i-e Toyota Prius and Mercedes Benz GL Class. Let’ see which one keeps up to your expectation. Mercedes GL-Class is a luxury SUV that first came in 2007 with two trim levels: GL320 CDI and GL450. The GL320 CDI ran on diesel engines. In 2009, GL320 Bluetec took the place of GL320 CDI. The fuel efficiency was enhanced, the navigation system got hard-drive-based functionality, and the COMAND interface was upgraded. The GL350 Bluetec SUV is the newest version powered by a turbocharged 3.0-liter V6 diesel engine and “4Matic” all-wheel drive gives you a powerful performance. An impressive EPA rating is achieved i-e 19 mpg combined. It is comfortable enough for 7 passengers and you can easily relax in it. The Toyota Prius is a full hybrid electric car that came in 2001. It was a small sedan in the beginning but the second- generation car got some improvements with stronger new batteries like nickel-metal hydride (NiMH) battery pack . However, the third generation became more popular due to its fuel efficiency. The 1.8-liter4- cylinder engine when mated to electric motor can give 134 HP of total output power. The EPA rating of 50 mpg combined gives more mileage. The two vehicles differ each other in almost everything whether its their exterior styling or interior design. Mercedes GL350 Bluetec exhibits a stylish exterior with automatic headlights, a sunroof , LED running lamps and 20-inch wheels. The parking sensors and a blind-spot warning system keeps you safe while driving. The interior is also lavish and is equipped with dual-zone automatic climate control, heated 10-way power front seats , MB Tex premium vinyl upholstery and a telescoping steering wheel. Mercedes COMAND electronics interface, Bluetooth, Mercedes mbrace emergency communications system are its best technology features. The handling of the vehicle is easy and it is more efficient in terms of power and performance. In contrast, the Prius is styled with Hybrid Synergy Drive blue accent badge, LED tail and stop lamps, Projector-beam halogen headlamp and 15-in. 5-spoke alloy wheels. The interior is high-tech with the center-mounted digital data panel, dash-mounted touch screen, button-rich steering wheel and joystick-like gear selector. Driving the vehicle is a bit difficult in windy weather and the front seats don’t feel so comfy. GL350 Bluetec can give zero to 60 mph acceleration times in 9.1 seconds while the third-generation Prius accelerates up to 60 mph in 10.1 seconds. The fuel efficiency of Prius cannot be matched with GL350 Bluetec..But its EV mode give slow speeds even when batteries are well charged. Mercedes GL350 Bluetec is better in terms of space and practicality but it is pricier than the Prius. Both are environmentally conscious cars. Now it’s up to you which one you choose the hybrid or diesel.